I’m on a shopping binge lately for health and beauty products, perhaps too much reading the Girltalk forum is BI =). One of the raves is Styli-Style products especially the eyeliners. The girls are raving about it partly because there’s an Ebay seller that sells them dirt-cheap, Styli-Style Flat Liners are Php 75 each!!! Beauty Bar sells these at approximately Php 400. So who’s that Ebay seller?… just search jnlink777. Human Heart Nature is a local company that sells organic, 100% Philippine ingredients and 100% chemical-free personal care products. 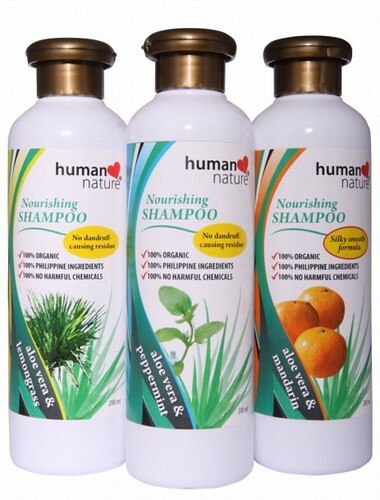 Human Heart Nature products are one of my first few buys that are organic so I ordered trial sizes first especially their shampoo and conditioner. Trial sizes are 50 ml. and only priced at Php 29.75, (less than a dollar). After finishing up the trial sizes, I ordered full sizes, 200 ml., of Aloe Vera Nourishing Shampoo and Mango Butter Nourishing Conditioner both in Mandarin scent. Cyleina Organic Soaps has been popular in many online forums like Girltalk and Teentalk for almost 2 years now. The soaps are lovingly handmade and uses organic ingredients and pure essential oils to make the skin soft and moisturized. Perhaps, the reasons why Cyleina Organic Soaps are popular is because it’s affordable and effective. I tried other organic soap brands that are priced at Php 100 or more, but after a few uses, I can’t finish the whole bar because it already melted on my soapdish. With Cyleina, I can still use the soap and gives enough lather even until it’s just the size of a pea. There are so many varieties to choose from so it’s unlikely for you not to find one that suits your skin best. For only Php 60 per bar, you can try them all until you find the best soaps for you.